Carrots date back to Roman times, but our common orange carrot was developed in Holland in the 1600's. Originated from market gardeners in Danvers, MA and introduced in 1871. Sweet and tender bright orange coreless roots yield well in heavy soils. 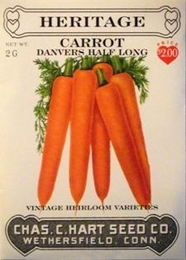 Danver's Half Long Carrots are a uniform 6 to 8 inches long by 2 inch diameter roots and store well into winter. Plant seed outdoors as soon as soil can be prepared. Plant in rows 15 inches apart spacing seed 1/2 inch apart in the row. Cover seed with 1/4 inch of fine soil, well pressed sown. Keep moist until seeds sprout. Soak seeds a few hours before planting to aid germination. Bulk Heirloom Carrot seed available. 23,000 Seeds/oz. Plant 1/2oz per 100ft row. 3lbs of Heirloom Carrot seed needed per acre. Average Heirloom Carrot yield per acre - 494 bushels cut, 800 bushels bunched.